Welcome to this episode of Genealogy Girl Talks. My name is Melissa from genealogygirltalks.com and I am here to teach you how to get started in your own family history and genealogy. I offer tips, tricks, and advice that I've learned on this 20+ year journey and I am delighted that you are joining me. 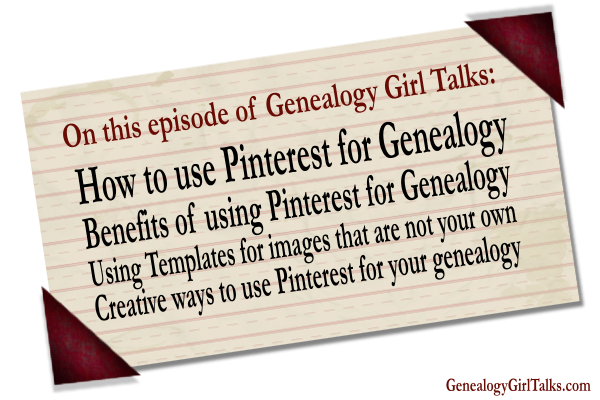 On this episode of Genealogy Girl Talks I would like to share with you some tips, tricks, and ideas on using Pinterest for your family history and genealogy. Have you ever considered using Pinterest for your family genealogy and family history research? I started using Pinterest a little while ago and I absolutely love it! Its a great way for me to organize family photographs, documents, and other interesting bits of information that I've found around the internet. PLUS, as an added bonus, the link to the document, family photograph, biography, cemetery, and all that information is provided once you pin it and you can easily share that with family and friends. Want to learn more about Pinterest for you family genealogy and family history research? Are you interested in using Pinterest to build your family tree? In this episode I will cover the benefits of using Pinterest for Genealogy, creative ways I have seen other people use Pinterest for their family research, and advice on using a template for those documents and images you do not personally own (copyright information). Click below to listen to this episode of Genealogy Girl Talks or you can subscribe to us in iTunes. Thank you for listening to this episode of Genealogy Girl Talks. If you would like to show your appreciation for these podcast episodes, head over to genealogygirltalks.com and buy me a cup of coffee, check out the Genealogy Girl Talks Shop for genealogy themed apparel and gift items, and sign up for our newsletter. Thank you and keep shaking your family tree! I've hesitated to share family photos and info on Pinterest. I enjoyed this podcast episode, especially your description of the three types of family boards that have inspired you and your great idea for pinning links to census and other records that can't be pinned directly. Thanks! Great information! I am new to using Pinterest for genealogy and excited to make use of this tool. Thanks so much for doing this.